Yes, it can be tricky to grow as it often runs to flower before producing many leaves. The trick is this… give it a try now in the cooler weather. Grow coriander in a cool moist spot. Sow seed directly into soft soil and water in with Fulvic acid to stimulate germination (Fulvic acid is available from me for pick up only, just email). These are another tricky vegetable, and everyone wants to grow them and pull carrots from the ground. They are so much sweeter when fresh too. 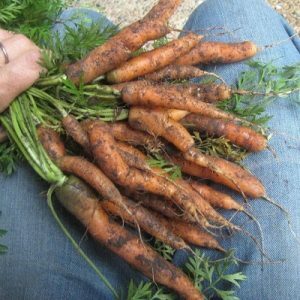 Avoid fertilising the soil just before sowing the seed or you’ll get leggy carrots. You need to put them in after a previously fertilised crop such as tomatoes or corn. Don’t be tempted to plant them from punnets, just grow from seed for the straightest roots. Punnet carrot seedlings are massed together and are difficult to separate, plus if you bend the hair-like root even the slightest, that’s the way the carrot will stay. Crooked! Seeds or seedlings. I’m putting in Black Krim which are a medium sized tomato with a dark red skin as they yield well and have fewer problems. The tomatoes in my hands in the picture at right are cherry tomatoes. These are perennial favourites for many of us. 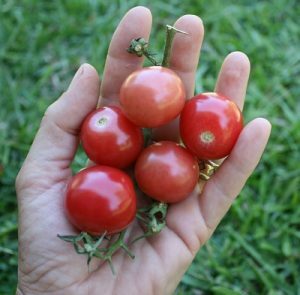 We’ve just said goodbye to a wonderfully giving heirloom Brown Berry tomato vine that grew all over the chook house and yielded many many kilos of tomatoes over a 12 month period. It too was a cherry type. The seed were originally from Eden Seeds I think. 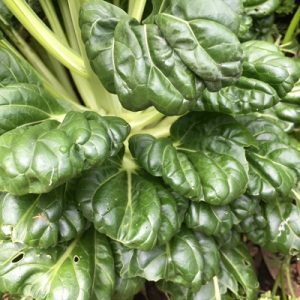 Asian greens such as Tatsoi (pictured) and Pak choy are reliable and easy to grow. 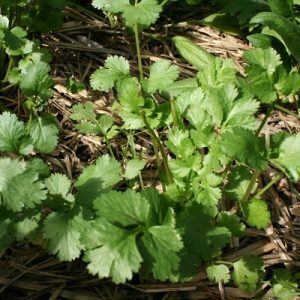 They are so easy and cheap from seeds, and so fast to grow, that you don’t need to buy seedlings. 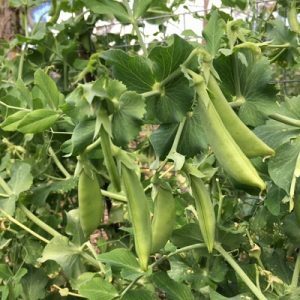 If you let your best plant go to seed, it will supply bees with pollen as it flowers, then as it dies down, the brown seed pods will release hundreds of seeds that will sprout in situ to provide you with all the new seedlings you could ever want. I transplant these littlies around the garden to my newly fertilised beds and bingo, another crop, free of charge from mother nature. 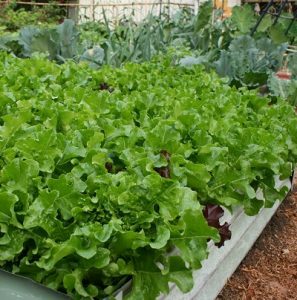 These beauties will do well in spring with good water and fertile soil. Grow quickly for the best results. Cos lettuce is the delicious lettuce used in Caesar Salad. Pictured above is an heirloom variety mix including ‘Oakleaf’. Our winter crop has given us so many, we are selling them. The spring crop is just as good and yes I grow them over summer too. The secret to this abundance? A dusting of lime to the soil and a watering with Instant humus before planting. Foliar feeds of seaweed solution during the growing season and some Liggy Max liquid fertiliser (I have some in stock for pick up only ) will prolong plant heath and harvest. Pick them young and in the mornings while they are still crisp. Any that age and go brown on the vine are then dried and kept for next season’s planting. I grow these all through the year, but find the cooler months with less heat and humidity to be really successful. Those potatoes that have sprouted in the pantry should be dug into a trench enriched with organic fertilisers and as they grow, slowly fill in the trench around the leaves. As the plant dies in about 3-4 months, the potatoes will be ready to dig out. Planting potatoes in summer in the tropics and subtropics will lead to disappointment as the heavy rain rots them in the ground. These pictured are ready to go into the ground. I expect to get a kilo or so from each potato. Larger potatoes with multiple sprouting eyes can be cut into several pieces and after drying overnight, each piece is planted separately. 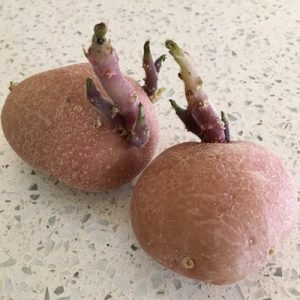 Seed potatoes are disease free, but you shouldn’t have any problems with home grown spuds from the pantry if you only grow them for one season.